If you’re lucky, you’ve seen it: The poetic silhouette of a gray whale lifting its peaked tail flukes high above the surf. The action lasts but a moment, and although it might appear like a greeting from these enigmatic sea creatures, it signals a dive to feast near the bottom of the ocean floor. It might make you wonder: what’s life like beyond the surface level for these gentle giants, and why do they migrate so far? “People have an unusual interest about whales everywhere in the world, in part because they know they are mammals like us,” says Bruce Mate, director of the Marine Mammal Institute at Oregon State University. 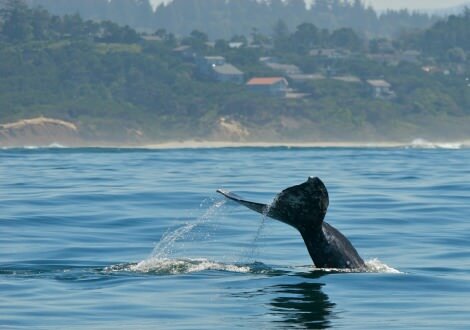 The gray whale is one of the most easily spotted whales on the Oregon Coast, as their south- and north-bound migration brings them close to shore. “When migrating, they are moving between highly productive areas for food in the summer and warmer waters in the winter where they breed and calve,” says Mate. 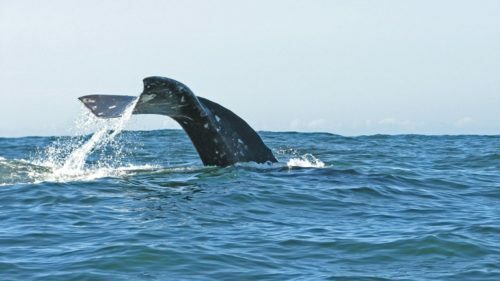 One of the many wonders of gray whales is that they have one of the longest annual migrations of any species, swimming more than 10,000 miles round-trip between their feeding grounds in the Bering, Chukchi, and Beaufort Seas of the Arctic to nursery lagoons in the warm waters of Baja California, Mexico. The grays can cover about 100 miles a day, coasting at the around 3-6 miles per hour — an impressive speed for the grand creatures, which span a length of up to 50-feet for adult females, and weigh up to 30-40 tons. On each trip, approximately 18,000 gray whales swim by the Oregon Coast, often within five miles of the shore. “There are about 200 whales out of a population of 20,000 gray whales that are called PCFG (Pacific Coast Feeding Group),” says Mate. 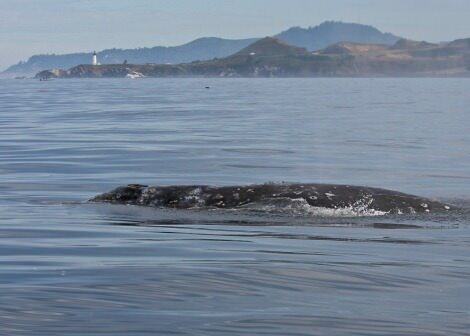 These gray whales feed from Kodiak Island in Alaska, south to Central California. 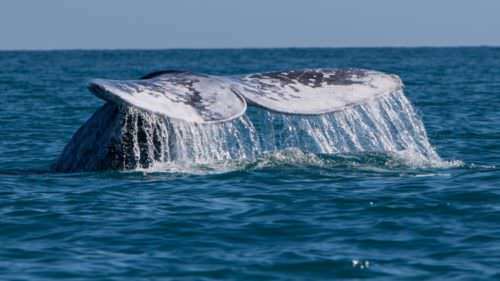 “We see many of the same ones every year,” adds Mate, who has been studying the migration patterns of gray whales since 1974. But Mate won’t be surprised that with the continued arctic ice melting, more gray whales end up in the Atlantic Ocean. “It’s already happened a couple of times with individuals, and they were in a sorry state because they don’t know where to go in the winter to find mates and they don’t know the best places to go for food,” he says. As individuals, those whales will die out. “But it will take a long time to establish patterns,” he says. 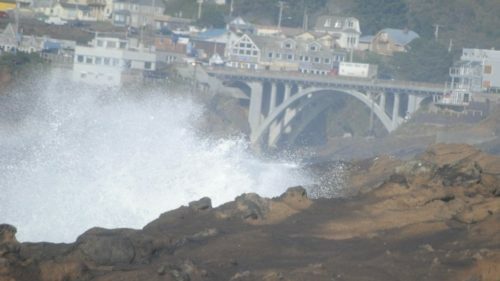 Some of the best locations to observe these gray whales are the areas around Depoe Bay, Yaquina Head and Port Orford, and just over the southern border near Crescent City. Mate refers to these areas as “foraging hotspots,” where pods cluster and feed on mysid shrimp, a crustacean found in kelp beds near the ocean bottom. The best viewing time in terms of volume of animals is early January, during the southbound migration that’s led by pregnant females, coasting to warmer waters for birthing. “We have up to 30 whales an hour going by in Oregon,” says Mate. “If the weather has been nice — that is not rough and windy with tumultuous seas, we can see animals very close to shore,” he adds. For up-close portraits of whales, visit the Coast during the slower-paced northward migration that occurs in waves and spans from late February to early June, when volunteers with the Whale Watching Spoken Here program provide interpretive information to visitors. Editor’s note: The Whale Watching Spoken Here® program hosts two Whale Watch Week annually, where volunteers help visitors spot whales and explain the migration. The Winter 2018 Whale Watch Week takes place December 27-31 and the Spring 2019 Whale Watch Week takes place March 23-31. For more information, visit Oregon State Parks.